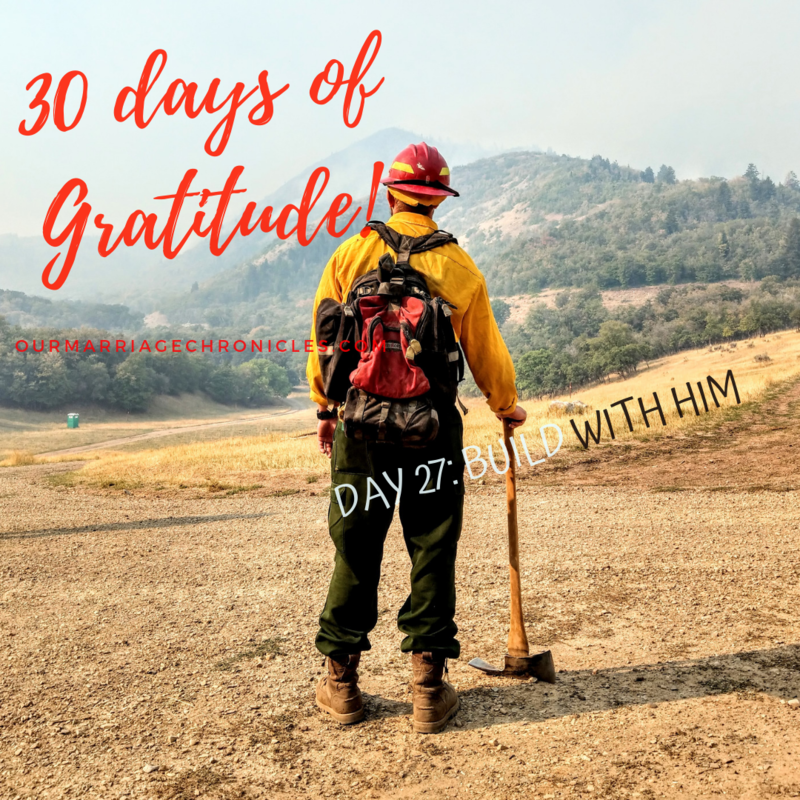 30 DAYS OF GRATITUDE: DAY 27: BUILD WITH HIM. D.I.Y: Sit your husband down and ask him where he would want your family to be in 2, 3, or 5 years. Note them down and listen in. Ask him how he would like to be helped. Go point: Be sensitive to his need for encouragement. Did you use unity sands in your wedding day? Or lit up a unity candle and blew away your individual candles? By now, if you have been married for even a week, you know very well that building requires more than just mixing up different sands in a single jar. The jar really gives you some nice décor, but that’s just it. Décor. It plays no part in your marriage. It’s more like a keepsake. You are two different beings and you require some serious level of adjustment and grace to build. The work of building is not easy. Cultivation is not easy. If you have been to a construction site or even passed by, you realize how messy the place always looks like. There is huge machinery work that’s involved, more so if the building is to be a sky scraper. The foundation is dug so deep and so is the work that goes on. The foundation of a building is everything THAT A BUILDING NEED TO BE TO STAND. By knowledge the rooms are filled. With all precious and pleasant riches. These three things are necessary in order to build a successful marriage and consequently a home. Wisdom, Understanding and Knowledge. All these three GOD GIVEN TOOLS combined bring in riches eventually. It’s unfortunate how the world has lied to us, that we need to bend, compromise our dignity, probably wreck someone’s home by “taking over” her marriage, in order to get rich quick and easy. God is a God who moves us from glory to glory. He knows no shortcuts. He is the same God who own silver and gold, cattle on a thousand hills belong to Him, why don’t we trust Him through the process? Do you know how the Lord defines wealth? He defines it as prosperity of the mind, soul, spirit and yes, physically. You cannot have physical riches and term yourself as wealthy. Your mind has to prosper, your spirit has to prosper and your soul has to prosper. Why, because material gains do not bring the peace that only Christ brings. Corruption doesn’t bring you wealth. Breaking the home of another woman doesn’t bring you wealth. Only God can prosper you! Get building with your husband. Begin from the foundation, up. Make your own legacy. Cultivate your home. Be intent in digging out old root stumps so as to get a healthy ground for a deep root system. The focus of building and cultivating your marriage should be the fruits that your marriage will eventually bring. Fruits of love, patience, forbearance, loyalty, faithfulness, friendship, openness, fun, all these and more. Your marriage will be strong enough to withstand the tides and billows of life. If you are to be a wife, and a wise wife, learn to court wisdom and make her abide with you in your home. If you are to be a wife, and a wise wife at that, be very understanding to your husband. Remember that you are different. If he is to think like you, he needs to be a woman, you don’t want him turning into a woman, do you? If you are to be a wife, and a wise wife at that, never stop wanting to know more. Get knowledge. Put new ideas into your marriage. Get new interests and be interested in what interests your husband. Get building. VERSE OF THE DAY: Proverbs 24:3-4 Through wisdom a house is built, and by understanding it is established; By knowledge the rooms are filled with all precious and pleasant riches. I thank you for the grace that you bestow upon us. You have asked us to ask you for wisdom for you are a benevolent God, who gives wisdom without measure. This day I ask for wisdom to be able to build my home. I ask for a heart of understanding that I will be patient as we grow together in our marriage. I ask for the zeal of knowledge. That I will never stop wanting to learn, grow and put new ideas that would work for my marriage. Give me grace Lord. Help me build my home with you, for if you build our home, our foundation is a sure promise. Holy spirit, make us make bear fruits that will prove you Jesus to world full of hate and gall, more so to the offspring that you will bless us with. Next PostTHE SEASON OF SINGLENESS.